Last Wednesday, I wasn’t sure where to take “large”. On Thursday, I’d been given the best idea ever. I had dinner with mis tres amigas last Thursday to celebrate my birthday. We told stories, laughed at ourselves, consumed cheesecake and double bubble. All while sitting next to the most ridiculously huge birthday balloons that Little Skipper had dragged in. They are large. Quite large. So large, in fact, they almost didn’t fit in my trunk. They’re also hard to control when trying to take a self-portrait. But their big and fun and perfect for a birthday. This self-portrait is brought to you with another birthday gift: a remote for the Mac. My heavens, you have no idea how much easier that remote made taking an SP! I was able to shoot off 60 images with only having to get up five times. Learning what focus point to use with the remote will take some time but some experimenting went down. I had low light to work with so the aperture stayed at f/6.3 – if the light was better, I would have stopped it down to f/10 or f/14 (to extend the DOF) but then I’d sacrifice my shutter speed. And I didn’t want a big blur. The 19-point AF didn’t work right for this set up because it kept focusing on my feet – I switched it over to the Zone AF which brought the balloons into focus. Much better. And now I’ve got to get myself over to the WPC Flickr Group to see what others did with “large”. And don’t forget about the Challenger Roll – a few more people have joined so if they’re posting to the group, I’ll add them to the roll. It’s March. And week 10 is here. (Week 10… you’ve got to be kidding!) Randomly selected subject for this week is MESS. Hmm… what to do with this one? Good luck, have fun and happy snapping! 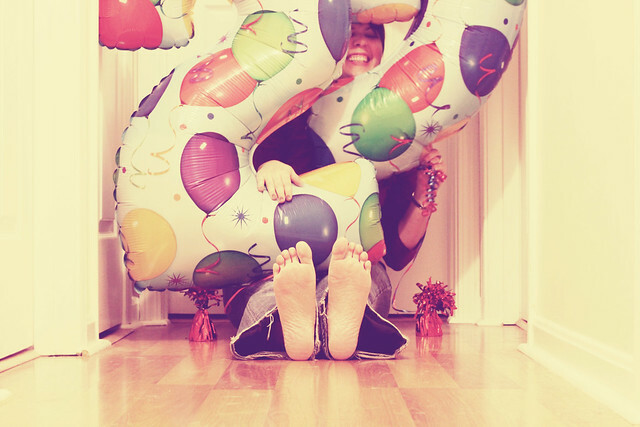 Kelly (the dSLR newbie) - Accurately described, ‘the most ridiculously huge birthday balloons’ – love it!! I’m noticing your photos have a certain style to them, and they never disappoint. This one included, great shot! And a remote is on my wish list, totally inspired by your SPs. CraftyCripple - Mess, haha, all I have to do is point it at my yarn stash. Whitney - I didn’t even realize this was you when I commented on it in the group! haha! I feel that whoever bought you these must know you pretty well. To me they seem very “you”! © 2019 Shutterboo Photography|ProPhoto4 Blog by NetRivet, Inc.